1. the diffusion of solute molecules through a semipermeable membrane, normally passing from the side of higher concentration to that of lower. A semipermeable membrane is one that allows the passage of certain smaller molecules of such crystalloids as glucose and urea, but prevents passage of larger molecules such as the colloidal plasma proteins and protoplasm. adj., adj dialyt´ic. continuous ambulatory peritoneal dialysis (CAPD) peritoneal dialysis involving the continuous presence of dialysis solution in the peritoneal cavity; see discussion at peritoneal dialysis. continuous cycling peritoneal dialysis (CCPD) a procedure similar to continuous ambulatory peritoneal dialysis but taking place at night, using a machine to make several fluid exchanges automatically. See discussion at peritoneal dialysis. dialysis dysequilibrium syndrome a condition occasionally seen following overly rapid hemodialysis, characterized by increased intracranial pressure that causes nausea, headache, vomiting, restlessness, and a decreased level of consciousness. The neurological complications may lead to coma and death if not treated. The cause of this syndrome is thought to be the rapid decrease in the blood urea nitrogen that accompanies dialysis. Called also dialysis dysequilibrium. extracorporeal dialysis dialysis by a hemodialyzer; see also hemodialysis. intermittent peritoneal dialysis (IPD) an older form of peritoneal dialysis in which dialysis solution is infused into the peritoneal cavity, allowed to equilibrate for 10 to 20 minutes, and then drained out. See discussion at peritoneal dialysis. peritoneal dialysis see peritoneal dialysis. peritoneal dialysis a type of hemodialysis in which the peritoneum surrounding the abdominal cavity is used as a dialyzing membrane for removal of waste products or toxins accumulated as a result of renal failure. Substances that can be removed in this way include crystalloids such as urea, creatinine, electrolytes, and drugs such as the salicylates, bromides, and barbiturates. The exchange of substances across this type of semipermeable membrane involves three physical processes: diffusion, osmosis, and solvent drag. In diffusion the random motion of the molecules of solids, liquids, or gases in solution causes a flow of each solute from regions of high concentration to regions of low concentration. Diffusible solutes, those with molecules small enough to pass through the pores of the membrane, flow from the side on which the concentration is high to the side on which it is low. Osmosis is a flow of water molecules (or some other solvent) through the membrane. The flow moves from the side on which the concentration of nondiffusible solutes, those with molecules too large to pass through the membrane pores, is low (and thus there is more water) to the side on which the concentration is high (and there is less water). Solutes with molecules of intermediate size are not retarded in their flow through the membrane, but their flow is subject to solvent drag, that is, the rate at which a solute flows through the membrane is increased by a solvent flow in the same direction and decreased by a solvent flow in the opposite direction. Indications and Contraindications. Peritoneal dialysis has the advantage of being more quickly initiated than hemodialysis because a dialyzing machine is not needed, anticoagulants are not necessary, and there is no need for vascular cannulization. Also, since chemical and fluid exchanges occur more slowly, there is less stress on internal organs. Acute and chronic renal failure are among the most common indications for peritoneal dialysis. Other indications are congestive heart failure and difficult or absent vascular access. Since certain drugs can be removed by this method of dialysis, some types of drug poisoning can be treated in this way. Peritoneal dialysis cannot be used when there is severe abdominal trauma, multiple abdominal surgical procedures, adhesions, severe coagulation defects, paralytic ileus, or previous diffuse peritonitis. The Procedure. Fluid equal in osmolarity and similar in chemical composition to normal body fluid is introduced into the peritoneal cavity via a catheter. The fluid infuses by gravity; its rate of flow can be controlled by lowering or raising the container of dialysate or by manipulating the occlusive clamp on the tubing. The length of time the dialyzing solution is left in the peritoneal cavity depends on the molecular weight of the substance to be removed and the amount of dialyzing solution used. Substances with low molecular weights equilibrate in two to three hours, while those with high molecular weights can take more than 12 hours to move across the membrane and equalize the concentrations of the two solutions. This period of equalization is sometimes called the “dwell time.” It is followed by a period of drainage to complete the dialysis or to prepare for instillation of fresh dialysate. Peritoneal dialysis is done in one of three ways: Intermittent peritoneal dialysis (IPD) can be done manually or with an automated cycling machine. The dialysate is introduced, allowed to dwell for a specified number of minutes, and then drained. Automated IPD is usually done while the patient sleeps. Continuous ambulatory peritoneal dialysis (CAPD) is performed continuously by the patient on an outpatient basis. The dialysate fluid dwells for four to eight hours: the drainage bag is clamped, folded and held in the person's clothing during this time. When the dwell period is over, the catheter to the drainage bag is unclamped and the dialysate fluid is drained by gravity. A new bag of dialysate is then started and the process goes on over a 24-hour period. Continuous cycling peritoneal dialysis (CCPD) involves the use of a cycler for exchanges while the client sleeps. The last exchange before the patient arises for the day is allowed to dwell for the day, avoiding the interruption of daily activities for maintenance of the system. Because hemodialysis is more efficient in removing toxins from the blood and body fluids, it has always been the treatment of choice for end-stage renal disease. There are certain patients, however, who fare better on less drastic and gentler dialytic therapy and who can benefit from continuous ambulatory peritoneal dialysis. The procedure is becoming an accepted alternative for persons with either chronic or acute renal failure. Complications. The most obvious complication of peritoneal dialysis is peritonitis, which is a real danger to any patient receiving this treatment. Contamination of some part of the system, a malfunctioning piece of equipment, contamination of the fluid, and infection of the catheter site are all possible sources of peritonitis. The catheter itself can cause complications through leakage at the site of insertion, infection, and occlusion of the perforations on the catheter. Respiratory difficulty can occur as a result of fluid retention that increases pressure against the diaphragm, and fluid overload that requires the more frequent use of hypertonic solutions. Fluid depletion and hypotension are also possible complications. Patient Care. To avoid complications strict adherence to aseptic technique is essential. If there is any break in the tubing connections during the procedure the peritoneal cavity must be considered contaminated. If the tubing becomes blocked the physician should be notified immediately. An exchange record is kept of the fluid that is introduced into and withdrawn from the peritoneal cavity. The amount withdrawn is expected to closely approximate or be slightly more than the amount introduced. The exchange record contains information about the starting time of infusion, amount infused, concentration of fluid and drugs added, finishing time of infusion, starting time of drainage, volume of drainage, and total patient fluid loss (−) or retention (+) up to the time of recording. Since this last item is frequently a source of error, it is essential that all personnel involved in the dialysis procedure know how the recording is done. Daily weight on a stretcher scale facilitates calculation of fluid loss or gain. The peritoneal drainage fluid is observed for cloudiness and the presence of blood or other abnormal constituents. The vital signs are recorded at frequent intervals so that early signs of shock or the development of an infection can be discovered. Respiratory difficulty may develop as a result of pressure of the fluid against the diaphragm. Mild dyspnea may be relieved by elevating the head of the bed. Severe dyspnea may necessitate immediate drainage of the fluid from the peritoneal cavity and collaboration among health care professionals to ensure the patient's safety. 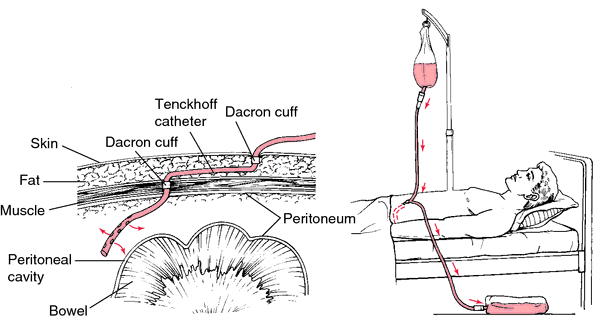 Manual peritoneal dialysis via an implanted abdominal catheter (Tenckhoff's catheter). From Ignatavicius and Workman, 2002.
removal from the body of soluble substances and water by transfer across the peritoneum, using a dialysis solution that is intermittently introduced into and removed from the peritoneal cavity; transfer of diffusable solutes and water between the blood and the peritoneal cavity depends on the concentration gradient between the two fluid compartments. A dialysis technique in which a solution is introduced into the abdomen through a tube and then drained out after waste products and excess fluid from the blood have diffused through the peritoneum into the solution. a dialysis procedure performed to correct an imbalance of fluid or of electrolytes in the blood or to remove toxins, drugs, or other wastes normally excreted by the kidney. The peritoneum is used as a diffusible membrane. Peritoneal dialysis may be performed nightly for chronically ill children while they sleep and also may be carried out regularly at home. It is contraindicated in patients with extensive intraabdominal adhesions, localized peritoneal infection, and gangrenous or perforated bowels, although peritonitis may itself sometimes be treated by peritoneal lavage and antibiotics administered during peritoneal dialysis. method Under local anesthesia a many-eyed catheter is sutured in place in the peritoneum and a sterile dressing is applied. The catheter is connected to the inflow and outflow tubing with a Y connector, and the air in the tubing is displaced by the dialysate to prevent introduction of air into the peritoneal cavity. The amount and the kind of dialysate and the length of time for each exchange cycle vary with the age, size, and condition of the patient. There are three phases in each cycle. During inflow the dialysate is introduced into the peritoneal cavity. During equilibration (swell) the dialysate remains in the peritoneal cavity. By means of osmosis, diffusion, and filtration, the needed electrolytes pass via the vascular peritoneum to the blood vessels of the abdominal cavity, and the waste products pass from the blood vessels through the vascular peritoneum into the dialysate. During the third phase (drain) the dialysate is allowed to drain from the peritoneal cavity by gravity. interventions The fluid is warmed to body temperature before instillation, and heparin, antibiotics, or other substances may be added to the dialysate. The patient's fluid balance, respirations, pulse, blood pressure, temperature, and mental state are frequently evaluated, and blood glucose and electrolyte levels are tested regularly. The amount of fluid instilled and the amount and character of the fluid drained are noted. Bacteriological cultures of the drainage are performed regularly. A low-sodium, high-carbohydrate, high-fat 20- to 40-g protein diet is usually offered. Medication for pain may be necessary. Much peritoneal dialysis is now done in the home, not in facility. VNA referral is done for appropriate teaching and assessment with follow-up in dialysis centers. The need for dialysis and the techniques, dangers, and advantages of peritoneal dialysis are explained to the patient and the family. outcome criteria Peritoneal dialysis may result in several complications, including perforation of the bowel, peritonitis, atelectasis, pneumonia, pulmonary edema, hyperglycemia, hypovolemia, hypervolemia, and adhesions. Peritonitis, the most common problem, is usually caused by failure to use aseptic technique and is characterized by fever, cloudy dialysate, leukocytosis, and abdominal discomfort. Dialysis may usually be continued while the infection is treated with antibiotics, which are given systemically or intraperitoneally. Atelectasis and pneumonia may result from compression of the thoracic cavity, with decreased respiratory excursion and blood flow to the bases of the lungs caused by an excessive volume of dialysate in the peritoneal cavity. Dyspnea, tachypnea, rales, and tachycardia require reevaluating the amount of dialysate, raising the head of the bed, and administering respiratory therapy to prevent atelectasis and pneumonia. Because patients with diabetes are at risk of developing hyperglycemia, serum and urine glucose levels are monitored, and, if necessary, sorbitol may be substituted for glucose in the dialysate. If dialysate fluid is retained in the peritoneal cavity, hypervolemia may occur, predisposing the patient to pulmonary edema and congestive heart failure. If the dialysate is removed too rapidly or if the dialysate used is a hypotonic glucose solution, hypovolemia may result. Adhesions often develop as a result of local irritation to the surrounding tissues caused by the intraperitoneal catheter. Nephrology A therapeutic modality used to clear toxic metabolites from Pts with terminal renal failure, using the peritoneum to filter waste products. See Middle molecules. Removal from the body of soluble substances and water by transfer across the peritoneum, using a dialysis solution that is intermittently introduced into and removed from the peritoneal cavity. A method of reducing the levels of waste products in the blood in cases of kidney failure, as an alternative to the use of an artificial kidney dialysis machine. Fluid is repeatedly run into the PERITONEAL CAVITY of the ABDOMEN through a CANNULA, allowed to reach equilibrium with the blood, and then removed and discarded. the diffusion of solute molecules through a semipermeable membrane, passing from the side of higher concentration to that of the lower; a method sometimes used in cases of defective renal function to remove from the blood elements that are normally excreted in the urine (hemodialysis). The principles of dialysis are utilized in renal dialysis with a hemodialyzer (hemodialysis) and in peritoneal dialysis. dialysis by a hemodialyzer. See hemodialysis. dialysis through the peritoneum, the dialyzing solution being introduced into and removed from the peritoneal cavity, as either a continuous or an intermittent procedure. See also peritoneal dialysis. 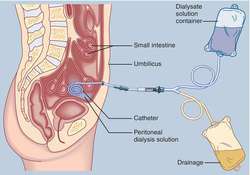 the use of an indwelling catheter with external tubing that is strapped to the body wall when not being used for infusion and drainage of the dialysate fluid. include vestigial remnants of primordial urogenital organs, cestode intermediate stages, inclusion cysts or lymphatic ectasia. the employment of the peritoneum surrounding the abdominal cavity as a dialyzing membrane for the purpose of removing acumulated waste products or toxins. In veterinary medicine, the main indication is acute, reversible renal failure. Certain crystalloids such as urea, creatinine and electrolytes, and some drugs, such as the salicylates, bromides and barbiturates, can be removed. Fluid equal in osmolarity and similar in chemical composition to normal body fluid is introduced into the peritoneal cavity via a catheter. After a period of time ('dwell time') determined by the molecular weight of the substance being used as the dialyzing solution, the fluid is drained and the cycle repeated. attachment and growth of other tissues to the peritoneum, e.g. a fetus escaped from the genital tract, direct metastasis of malignant tumors. the fluid normally present in very small amount in the peritoneal cavity. Acute peritoneal dialysis not only improves the manifestations of renal compromise but also provides the time-bridge for the future management in chronic renal failure. Best available evidence for peritoneal dialysis catheter exit-site care. Published reports regarding the management of mycobacterial infections in the peritoneal dialysis patient population are scarce. Patients and technique survival on peritoneal dialysis in the United States: Evaluation in large incident cohorts. Timing of peritoneal dialysis catheter removal after pediatric renal transplantation. Results: A total of 126 children underwent acute peritoneal dialysis for various indications and among them 60 developed different complications. Peritoneal dialysis has now become an established and increasingly popular form of renal replacement therapy. Peritoneal dialysis works inside the body, using the abdominal lining as a natural filter to remove waste from the bloodstream. Despite increased experience and advances in peritoneal dialysis, peritonitis remains a major cause of morbidity in patients on long-term CAPD and is the major cause of treatment failure and the need to transfer to haemodialysis. Peritoneal dialysis patients are not at high risk for infection and are not premedicated on the basis of dialysis alone.